We get connected with each other in the space that opens up when we let go of our ideas of good and bad, right and wrong. When we feel safe and connected to ourselves, we don’t need to use these labels. When we are connected to ourselves, we are also connected to the people around us. Part One: A Brief History of Empathy is whistle-stop tour from evolutionary times to the present, taking in the Buddha and Jesus, the origins of the word empathy and modern psychological research. Part Two: Empathy and Nonviolent Communication introduces Marshall Rosenberg, developer of Nonviolent Communication, and takes you through the practical skills of how to empathize, culminating in Empathy Archery. 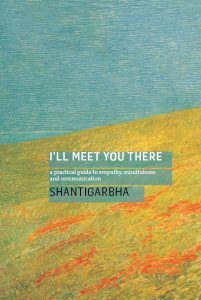 Part Three: A Buddhist Perspective explores how empathy is a fundamental part of this spiritual tradition. Part Four: Drawing the Threads Together looks at the development of empathy in children and the relation between empathy and compassion. You can buy the book from the Windhorse Publications website. The title of the book is a quote from the poem “A Great Wagon”, Rumi: Selected Poems , translated by Coleman Barks, with John Moynce, A. J. Arberry, Reynold Nicholson (Penguin, 2004).